Such a great lit mag and such a fun interview! Fem: Can you tell us about your blog? 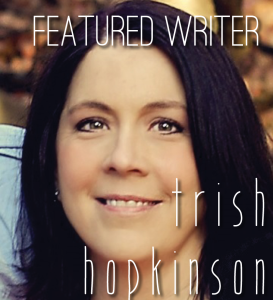 Trish Hopkinson: I started posting regularly and promoting my blog last October. I finished my bachelors in English end of 2013 and wanted to reach out to the poetry and writing online community. This last year or so I’ve been focusing a lot on submissions, reading lit mags, and craft in general, so I thought it would be great to share some of the things I’ve learned along the way. So far I’ve had a lot of positive response and met a lot of really great poets and writers who are doing similar things to support literary arts. Need a project or writing prompts for National Poetry Month in April?